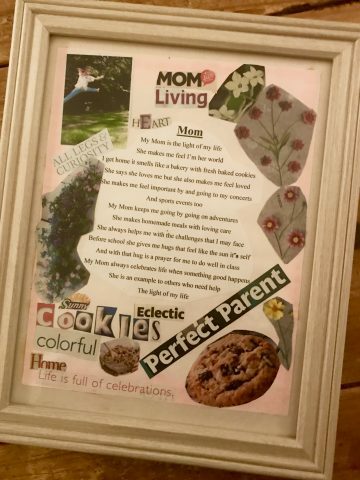 I have this poem collage on my desk in my office –it is my favorite kind of present from my kids-and I after just now re-reading it I am sobbing. Again. My daughter gave this to me when she was about in eighth grade. It is a snapshot into her sweet little heart. A sweet homemade gift from her heart. As I re-read the words and message in her poem collage, I think, oh my goodness; I am humbled by what she remembers about me, that she remembers the adventures and the homemade meals and that I had home baked items for her when she came home from school and that I gave her hugs before and after school and that those hugs felt like the sun and that I prayed for her and that I celebrate life and that I help others and that I support her in all her activities and that I make her feel like she is my world. 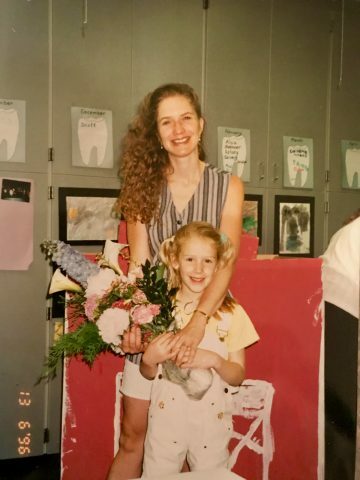 As I write this month for 30 Days#howimom30 these thoughts on motherhood and parenting and how we parent and how we mom and dad, I wonder, what will all of my kids remember about their growing up years? What will your kids remember? One way I see what my daughter remembers is the way she is a mom herself now of two little ones. 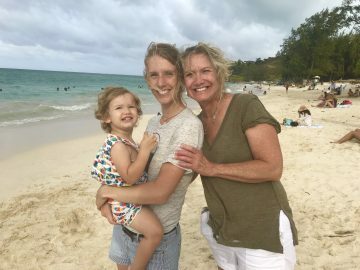 Such beauty and care and sweetness and adventure my daughter puts into motherhood. She is creating her own memories for her daughter and son. They will remember something about you. The question is what? So, truly one of the big ways I Mom is by Thinking about How I will be remembered. Dear fellow moms. This is what it is about. We can preach all we want but how are we living our lives? They will remember something about us. How we treated our kids, how we treated others, how we made our kids feel, how we supported them. Remember that as you mom.